What is ECU Re-mapping ? MPB 4×4 are an ALIVE Tuning Authorised Agent. The best in the business of Land Rover Remapping and Specialist Tuning. Most vehicles have what is called an ECU (or Engine Control Unit) which is a computer that controls how the engine works. Vehicle manufacturers automatically de-tune the engine by setting the software on the ECU to a default setting before sending the vehicle out. This is done because the manufacturers sell their vehicles all over the world, this means that the software settings inside the ECU have take into account the different climates, laws & restrictions and the varying quality of fuels. ECU Remapping is modifying the original software in the ECU to allow the engine to run at it’s optimum without any restrictions, this allows the engine to run as it was meant to. We are able to totally transform the drivability of all late model Land Rover models, from 1998 to date. With our attention to the finest detail, and many years of tuning expertise, our remaps produce real results that are quite simply second to none! Every car responds differently to tuning, due to differences in mileage, vehicle spec, and indeed to varying tolerances of engine manufacturing. For this reason, each and every car get’s it’s own unique, custom mapping, to bring out the best of the engine. Many Land Rover owners tow a trailer of some sort, and it’s when doing this, that the weaknesses of the car are really highlighted. Big horsepower conversions are not to everybody’s taste, as often our customers just want to brighten the car up a little, without putting too much strain on the engine and drive train, and maintain respectable levels of fuel economy. We focus mainly on removing the flat spots and improving torque so less gear changes are required, especially when towing. This gives a much more relaxing drive, and the engine will not have to rev so high, as the low end torque will pull you through the gears effortlessly. A remapped engine management system will significantly improve acceleration when overtaking, and make motorway cruising much more relaxing. It transforms the drivability of the car, but doesn’t have an adverse effect on fuel economy when driven normally. In fact, most customers report an overall improvement in mpg! Pulling out of junctions will no longer be a gamble, as you’ll have the confidence that your car will be able to quickly, and safely pull away without fear of it bogging down. Before we even start the tuning process, it is important for us to get an idea of how your car is driven, what the mileage and service record is like, and where you feel the engine’s shortfalls are? We carry out an engine diagnostic check, to ensure that all engine systems are running correctly, and that there are no unusual fault codes stored in the ECU’s memory. Once we’ve done this, the tuning can begin! One of the things that makes us so unique, is that all our remapping is done ‘on the road’, so we can easily gauge engine response under a number of real world tests, and make adjustments where necessary as we drive, until we have a final version that we are all completely happy with. Smoke emissions and Exhaust Gas Temperatures are always taken into consideration, so we can ensure your engine will not be over stressed at any point, and so maintaining the highest levels of reliability. Although all our tuning is unique, in some cases (Td5 for example) it can generally be broken into various ‘stages’ of tune, each giving it’s own leap in power and torque as the stages increase. The Stage 1 tune usually consists of an engine ECU remap only. This option is most suited to those who just want a nicer, more relaxing car to drive, while improving fuel economy. This makes the car noticeably quicker throughout the entire rpm range, but most apparent is the huge increase in low end and mid range torque available. This is especially welcome to those that use their Land Rover for towing. For those with Td5, or Puma Defender models who want more, there is the Stage 2 tune. This involves the fitting of a full size intercooler to take power and torque to the next level. We also increase turbo boost pressure, so as to take advantage of the more efficient intercooler. As this will allow more air (oxygen) to enter the engine, we would also further increase the fuelling to take advantage of the increased oxygen content, and hence produce a more powerful tune. Stage 1 tuning (Remap only) will typically raise power to about 150 -155 bhp, with torque in excess of 350Nm. Stage 2 tuning (Remap, Intercooler, Boost Upgrade) will take this further and push power up to about 170 – 180 bhp, with torque of around 390-400Nm being attainable. Want more? The stage 2 conversion mated with the rest of our tuning products, including our Hybrid Turbo, will give the ultimate Td5 experience, delivering in extreme cases well over 230bhp and 450Nm! Although the above quoted figures may look very impressive, the focus of our tuning is very much on drivability, and smooth power delivery. 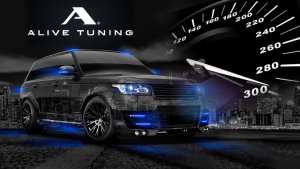 Many people can make big power with these engines, but the real benefit with our tuning is in the way it’s delivered, and that’s the Alive Tuning difference! Please be aware that remapping can invalidate your vehicles warranty! However, Alive remaps and tuning products are used by many franchised main dealers around the world, all of whom have complete faith in our products, as they know that no harm will be caused.